Complete your dream bedroom with a stunning solid hardwood wardrobe, a stylish and essential addition to any bedroom. Wardrobes are a staple piece of bedroom furniture and because they're often the second biggest item after the bed, they play a big role in the style of a room. To cater for all different tastes, the variety available today is breathtaking. Choosing the right wardrobe might seem like a daunting decision, but we aim to make it as straightforward as possible. Available in double and triple sizes, we have crafted the perfect armoire to provide you with ample storage space all at our renowned high-quality standards. Wardrobes are equipped with masses of hanging space, and more often than not they even have drawer space for heavier items and shoes. Ours in particular have plenty of room to hang your clothes, suits, dresses and accessories, and plenty of additional storage in the lower drawers. However, if you're planning on sharing, our triple wardrobes (a three door armoire) are probably the way to go. One thing you'll notice about our wardrobes is that we don't use sliding doors, opting instead for hinged doors. With sliding doors you can only view one half of your clothing selection at a time and poorly made sliding wardrobe doors mean you'll forever be battling to keep them on the tracks. However, with hinged doors you can see the entirety of your clothing and it will nicely complement a variety of interiors and are available in a number of design options. 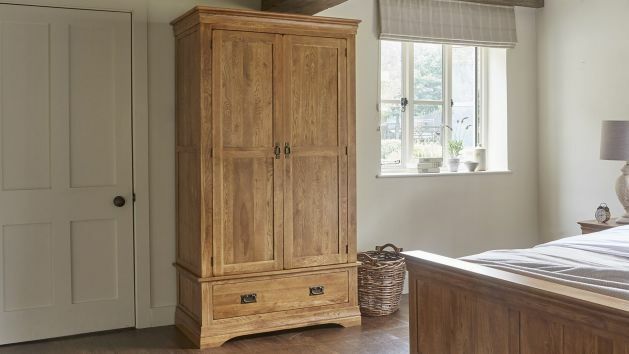 Our wardrobes are designed to match our furniture ranges and are crafted in 100% solid hardwood used throughout, even the back and drawer bases, and dovetail joints on the drawers. Browse our selection and complete your dream bedroom today!